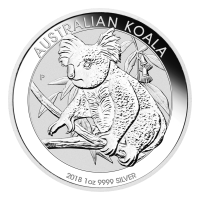 Purchase your 1 oz 2018 Australian Koala silver coin from our store today and enjoy the lowest price online. The renowned Perth Mint introduced their popular Australian Koala coin series in 2007 to celebrate a species that’s become synonymous with the land down under: that precious marsupial…the Koala. The obverse feature is none other than Elizabeth II, meticulously engraved by the hands of Ian Rank-Broadley, down to each hair of her head and jewel of her royal crown. The coin’s obverse also bears the queen’s informal title, the coin’s origin and denominational value. Not only is this year’s silver edition the first in the series to boast .9999 purity, it’s also been released under limited mintage, making the 1 oz 2018 Australian Koala silver coin a sought after collectible. What better way to appreciate Australia than with this tribute to its uniquely rich, indigenous wildlife; ready and set to enrich your portfolio now. Reverse A Koala roaming about its habitat. A Koala roaming about its habitat. 1 oz 2018 Australian Koala Silver Coin Purchase your 1 oz 2018 Australian Koala silver coin from our store today and enjoy the lowest price online. The renowned Perth Mint introduced their popular Australian Koala coin series in 2007 to celebrate a species that’s become synonymous with the land down under: that precious marsupial…the Koala. The reverse feature, which changes with each year’s release, depicts a busy Koala soaking up his natural habitat, a eucalyptus tree and a field of delicious gum leaves. The series title, ‘Australian Koala,’ as well as the coin’s weight, purity and year of release are also inscribed on the reverse and all is beautifully encapsulated in a simple double frame. The obverse feature is none other than Elizabeth II, meticulously engraved by the hands of Ian Rank-Broadley, down to each hair of her head and jewel of her royal crown. The coin’s obverse also bears the queen’s informal title, the coin’s origin and denominational value. Not only is this year’s silver edition the first in the series to boast .9999 purity, it’s also been released under limited mintage, making the 1 oz 2018 Australian Koala silver coin a sought after collectible. What better way to appreciate Australia than with this tribute to its uniquely rich, indigenous wildlife; ready and set to enrich your portfolio now.